Thailand is, in a word, paradise. And not the hyper-expensive, all-inclusive-resort kind of paradise, but the dirt-cheap, open-to-anyone, discover-the-secrets-of-life kind of paradise. Extend your budget by booking through StudentUniverse, where we negotiate the cheapest student flights that allow young people to see the world. 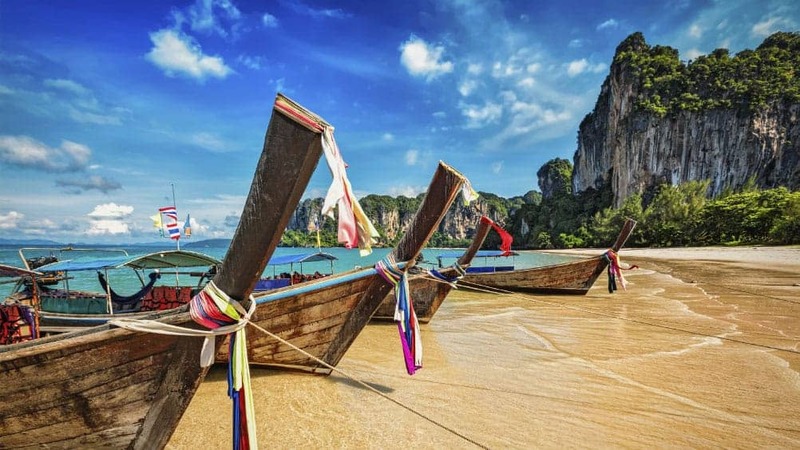 Use the money you save to stuff your face with world-renowned street food or explore the hundreds islands scattered along Thailand’s tropical coasts. Thailand is the perfect place to kick off your South-East Asia backpacking trip, upgrade your gap year or wrap up a year abroad. Students from all over the world fly to Thailand for it’s unique culture, seen in the monk’s temples, floating markets, boxing classes and elephant sanctuaries. Between the friendly locals and jaw-dropping geography this country is a no-brainer. So what are you waiting for? 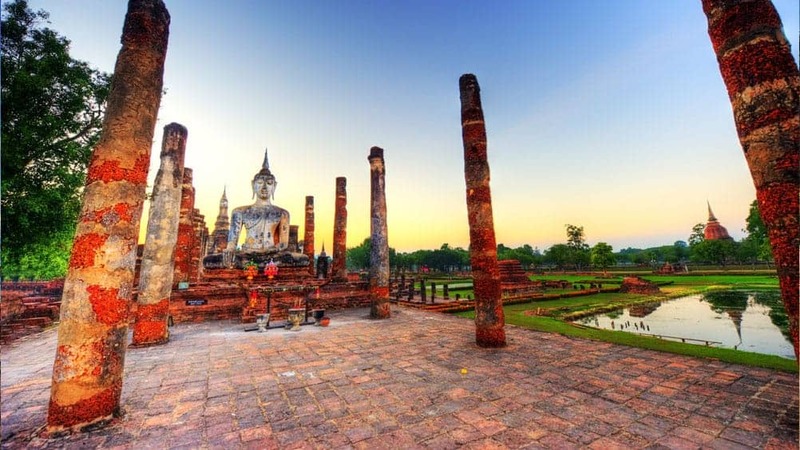 Book your cheap air tickets to Thailand today! When you arrive in Thailand, you should be approved automatically for a 30-day stay, which you can extend by a week at an immigration office. That being said, it’s never a bad idea to formally apply for a tourist visa at the Thai consulate before you go, especially if your plans are open-ended. Once you land, you’ll find food and accommodation extremely affordable (browse our cheap Thailand hotels for more info) and travelling in Thailand is as cheap as everything else! Consider purchasing a boat package if you plan on island-hopping, but you can easily get around the mainland on busses or trains. Rather than travel overnight, treat yourself to the day train from Bangkok to Chiang Mai. It’s dirt-cheap and the views of the countryside are outstanding! Plus, vendors hop on at every stop selling meals under 50p. Within the city, your options include the bus, metro and metered taxis (make sure they have a meter!). The bold of heart can rent a motorbike for just a few pounds a day. Kick off your trip in Bangkok, the country’s political, spiritual and commercial epicenter. As one of Asia’s most populated cities, traffic is a likely nightmare. Use the Skytrain or underground metro to get from place to place, or catch a tuk tuk to explore Bangkok’s more obscure corners. Head a couple hours west and you’ll find the old city of Kanchanaburi, a hotspot for WWII buffs who come to see the Bridge over the River Kwai and its corresponding museums. The relaxed, riverside atmosphere also attracts a fair share of backpackers to the city. That being said, the country’s most iconic backpacker destination is still Ko Phan Ngan. Its 30+ idyllic beaches complete with coconut tree hammocks scream “island paradise,” and its infamous full-moon parties are wild nights of eclectic music, frequent fire-twirling, non-stop dancing, booze-fueled madness. This rowdy island should be on every party-animal’s Thailand trip bucket list. Located in Bangkok, this complex served as a royal residence and main political arena from the late 1700s until 1925, when Thailand was still known as “Siam.” The palace’s iconic architecture and historical significance makes this one of the most important places to visit in Thailand. Consider hiring a local tour guide to show you every nook and cranny! Thai painter Chalermchai Kositpipat designed Wat Rong Khun (“White Temple”) in 1997. More modern art than place of worship, this all-white temple looks like it belongs in heaven itself. The intricate monochrome spokes reflecting in the surrounding koi ponds make Wat Rong Khun an essential photo-op if you’re ever near Chiang Rai. In Thailand, the elephant serves as a sacred symbol of everything from the Royal Family to Buddhism, but elephant tourism is shady at best. For an ethical encounter, visit the Elephant Sanctuary in Kuet Chang, a large park in northern Thailand where rescued animals roam freely among visitors. Trade in the chilly British winter for the buzzing nightlife and balmy, beachside sunsets of Thailand! Embrace off-season travel for an affordable and unforgettable trip. hai massages, sky bars, scuba diving and weekend markets: we’ve curated your Thailand bucket list so you won’t miss a thing! Is anyone surprised? Read why Thailand is a must-visit for foodies around the world and which countries measure up to it’s culinary glory.